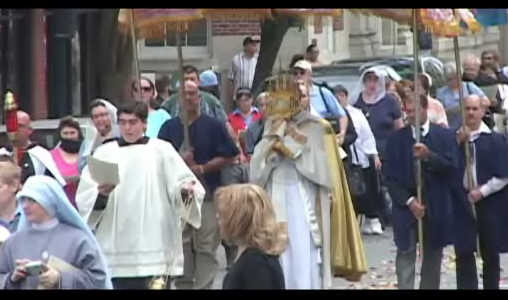 The annual Corpus Christi Procession organized by the FIs at Our Lady’s Chapel in New Bedford was held again this year with Our Lord being carried through the streets in a grand procession to three other churches, Our Lady of Purgatory (Maronite Rite), St Lawrence the Martyr’s, St. John the Baptist’s, and then back to Our Lady’s Chapel. Listen as Fra Terrence one of our Roving Reporters gives an on-location narration of the event. Thank you for posting this video. I usually attend every year but this year I was attending to my sister who’s dying of cancer and could not make it to New Bedford. However, the Corpus Christi procession was in my heart the whole day while myself and a Catholic theologian were bringing Jesus to my sister who’s been estranged from the church for over 20 years. Please remember her in your prayers. May God bless the Friars through Our Lady’s loving heart. What a beautiful video! Quite the professional job! Beautiful. Thank you for sharing your procession. What was the angelic music?